We have reached the end to another week on SuperPhillip Central. To make the upcoming weekend even more fantastic, I have a new review to share. Enter yet another mystery with Professor Layton leading the charge. 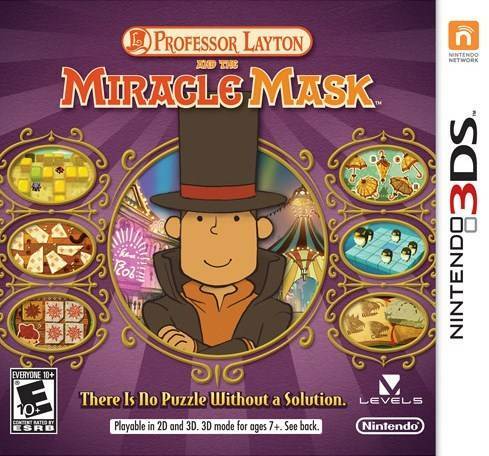 It's Professor Layton and the Miracle Mask for the Nintendo 3DS. When a series reaches its fifth game in less than the span of five years, there becomes talk of franchise fatigue. Professor Layton and the Miracle Mask is indeed the fifth installment of the franchise, and the first exclusively for the Nintendo 3DS. Despite having four prequels preceding it, The Miracle Mask manages to successfully keep the series fresh and relevant despite being the fifth game in just over four years. 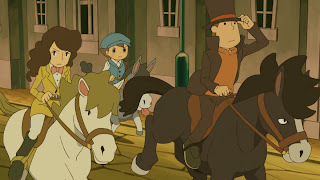 The story of Professor Layton and the Miracle Mask takes the good professor, his assistant Emmy, and his apprentice Luke to a thriving desert city known as Monte d'Or, after Layton receives a letter from an old schoolmate. The letter states the city is being tormented by the Masked Gentleman, a mysterious figure giving the town "dark miracles", such as turning townspeople into solid stone statues. It is up to Layton and his two companions to investigate, find a logical explanation for the happenings in Monte d'Or, and uncover the identity of the Masked Gentleman. The plot delves not only into events of the present, but the circumstances in Monte d'Or deal with Professor Layton's past as well. 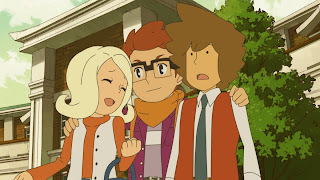 Each chapter alternates between the present and Layton's past as a teenager, showing how he became so enthralled with archaeology and especially puzzles. While some mysteries of the game are easy to ascertain before they are properly revealed, many will have you guessing until the very end. It is a touching story with plenty of questions for the player to ask. 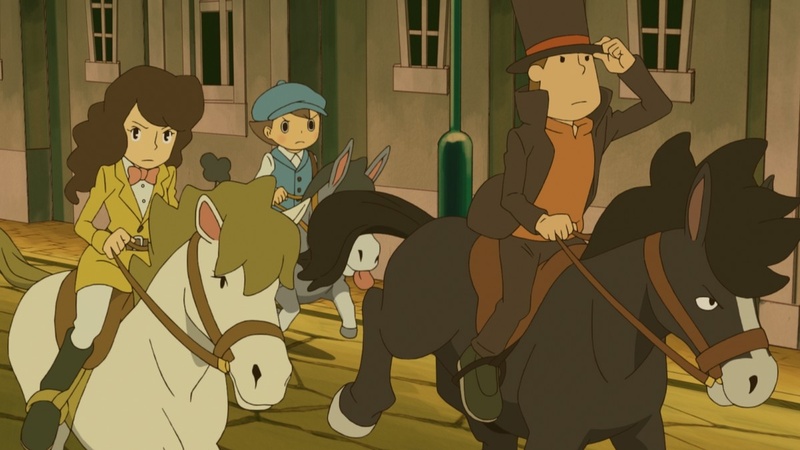 Get a peek into the past of Professor Layton. 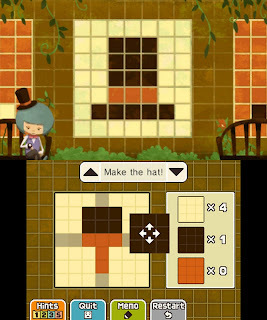 Professor Layton and the Miracle Mask, like all other games before it, is one part adventure game and one part puzzle game. The adventure aspects have you moving around from city section to city section investigating the surroundings, talking to civilians and other townsfolk, and progressing the story that way. Investigating each screen is much less taxing this time around. Miracle Mask has you using a magnifying glass to hover around the screen. When you are on top of an area of interest with the magnifying glass, it will turn orange. This is more efficient and faster than how previous games worked, requiring the player to tap everywhere on the screen like an obsessive-compulsive person. This means finding puzzles, hint coins (used to help solve puzzles), and hidden objects takes far less time and energy to do. That is a most welcomed change. The bottom screen shows sections of Monte d'Or. 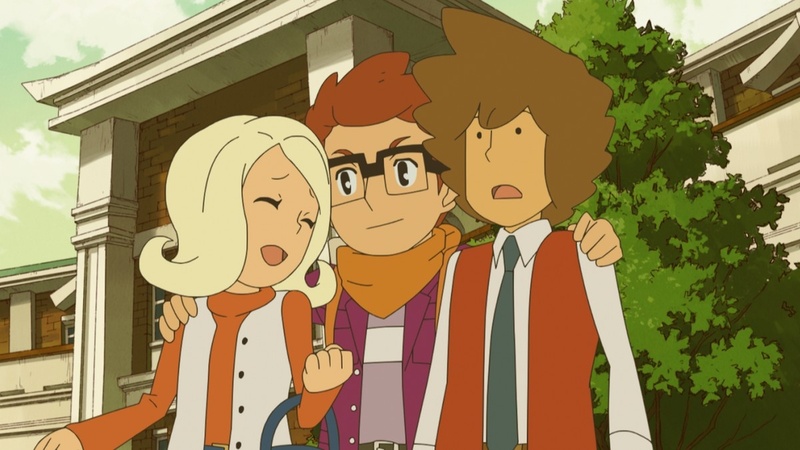 Also a most welcomed change is a chapter within the game that has a teenage Layton and his friend Randall exploring ancient ruins in a Legend of Zelda-like fashion. Most of the time you'll be moving through the ruins, solving boulder-rolling puzzles and avoiding robotic mummies. Yes, robotic mummies. 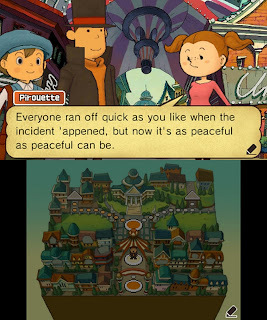 This chapter is a blast to play and is something I'd like to see expanded upon further in a future Layton game. Outside of that chapter and moving through Monte d'Or, conversing with civilians are puzzles. These are integrated into the story at nearly every juncture. Returning players to Layton's universe know that people there will generally not assist them without first solving a puzzle, or that puzzles pop up everywhere. For instance, a casino frequenter laments in the game about losing his hard-earned cash. Rather than just give Layton and his friends his sob story, he additionally throws in a puzzle his position reminds him of. There are 135 puzzles within the Miracle Mask. Not all need to be solved, but at a few points in the story, you will need to have completed a certain number of puzzles to proceed in the plot. Each puzzle awards you with picarats for solving them correctly. If you enter or guess the wrong solution, the amount of picarats that can be won decreases. Picarats are used at the end of the game to unlock features in the Bonuses menu such as art, voices, and profiles of the plethora of characters the professor, his apprentice, and his assistant will meet in their investigation. There are a variety of puzzle types: deduction puzzles, pattern-recognition puzzles, logic puzzles, math puzzles, perspective puzzles, etc. One of my favorite puzzles had me sliding penguins across an iceberg with the goal of getting the emperor penguin to the center. Others have you flipping slices of pizza over to get all of them to face up (the catch is that for each slice you flip, the adjacent ones also flip), trying to get all cats to turn brown by having them jump over one another as if you were playing a remodeled game of Chinese solitaire, and puzzles where you have to evenly divide a board into four pieces with the caveat of none of them being mirror images of each other. The fun of some of these puzzles is that the answers can be as simple or as difficult as you make them. I particularly love some of the solutions. Some are trick questions while others just require some outside-of-the-box thinking. My hat is off to you if you solve this puzzle. For these tougher puzzles, hint coins found in the environments of Monte d'Or can help in providing clues for players. You can get up to four hints. Each hint reveals more assistance towards the puzzle you're trying to solve, with the final hint, the Super Hint, basically giving the answer away. There are only two problems I have with the puzzles of Miracle Mask: 1) Some puzzles force you to switch between the instructions and the puzzle's image. What I mean by this is that if you have a puzzle that requires you to look at the puzzle's accompanying picture and the instructions to solve it, you're constantly and annoyingly switching between both with no option to have them on the dual screens of the 3DS simultaneously. 2) There are still many sliding block puzzles, the bane of many Professor Layton players' existence. Some puzzles are simpler than they seem. 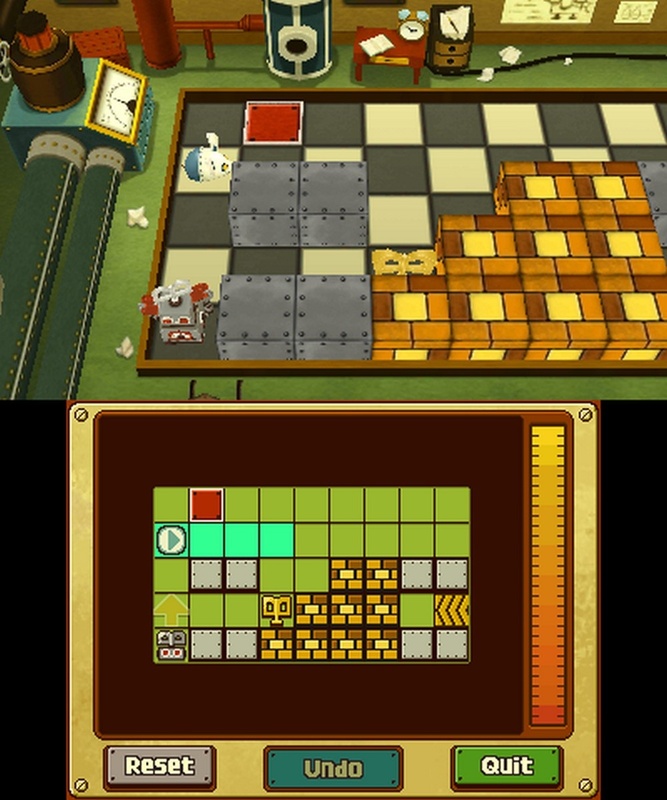 In addition to the puzzles to give players a lot of enjoyment, there are three mini-games, each with ten levels to play. The robot mini-game has you moving a wind-up toy robot through a maze of blocks, conveyor belts, and enemies. Your robot moves three spaces at a time. The objective is to land on the red goal space to clear each level. The shop mini-game has you organizing items on a shelf for customers to purchase everything in one go. This is done by putting like-minded items next to one another (e.g. a red apple next to a red banana, next to a yellow banana, next to a yellow lemon, and so forth). Finally, Luke befriends a rabbit, and that mini-game is all about teaching Luke's new pet new tricks. It's sort of like Nintendogs. The tricks learned are used to tell a story. Using the rabbit's actions at the right time help make a story that makes sense, allowing you to clear it. 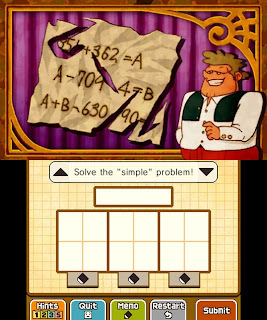 Completing each mini-game's ten levels unlocks three puzzles in the Layton's Challenges section of the Bonuses menu. Wind him up and watch him go. Outside of the content already on the 3DS game card (which will already last players upwards of 15-20 hours) are downloadable puzzles. Nintendo and Level-5 promise one puzzle each day for a year. Don't worry if you can't download a puzzle every day or fear about missing a puzzle. When you hit the download puzzle button, every puzzle you haven't yet received is downloaded. In theory, you could wait until a year from now and then download every puzzle sent out all at once. These puzzles aren't as complicated or complex as the story ones, but they are still entertaining to play and wrap one's head around. They come in twenty types. Professor Layton's latest upgraded its already stunning presentation from the DS for its 3DS debut. The hand-drawn characters are now three-dimensional models, but don't worry, they look excellent and they are animated splendidly. The environments are wonderfully designed, and all of the art in the game is fabulous. Like any Layton, there are fully animated cutscenes that, with the addition of stereoscopic 3D, jump out and look sensational. Additionally, like any Layton, there is an abundance of incredibly done voice acting to accompany a lot of scenes. Nintendo and Level-5 truly spared little expense in crafting the masterful presentation of Miracle Mask. Giddy up, Layton, Luke, and Emmy! 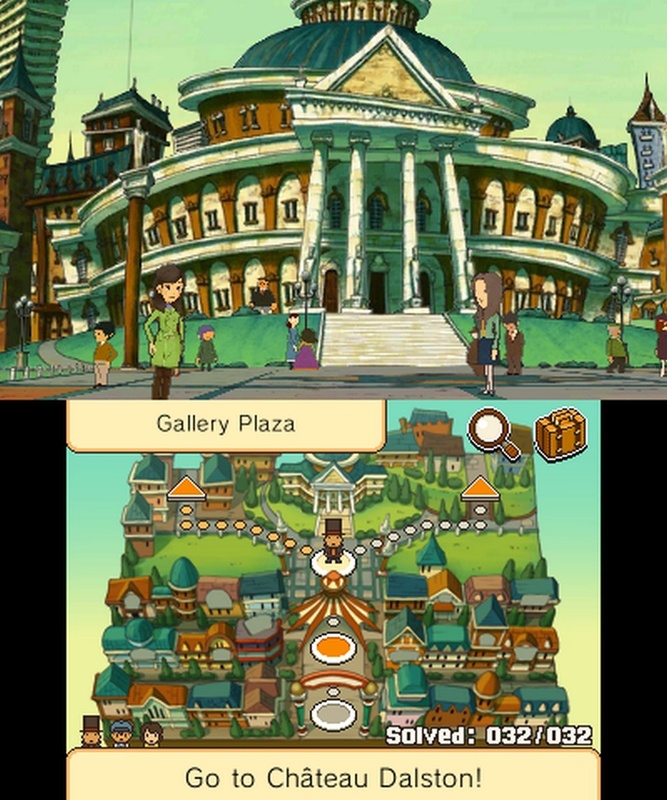 Professor Layton and the Miracle Mask is a fantastic first entry in the Layton franchise on the Nintendo 3DS. It is a game that will surprise you, astound you, and enchant you. It will make you feel dumb with one puzzle while it will make you feel like a genius at another. While the title for best Layton game is still held by Unwound Future, The Miracle Mask is definitely in the upper tier of Layton titles with its breadth of content and charm. Still, after five games, the formula is still being tinkered and tailored to avoid fatiguing fans. 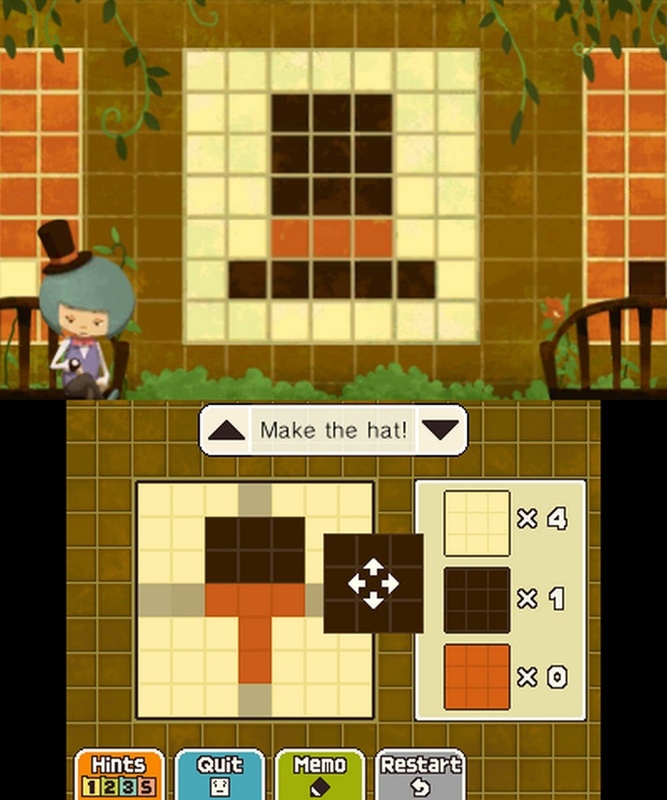 Like any good puzzle, Professor Layton and the Miracle Mask is certainly one game worth experiencing.